My work computer comes with a corporate disk image preloaded, and it is preconfigured with the German "QWERTZ" keyboard layout. Using the control panel, I added my preferred QWERTY layout so I could type without going nuts over the swapped Y and Z keys (and many of the special characters like ' * ^ # that I use a lot). Windows has never been good at handling multiple keyboard layouts and it kept switching back to German. So I removed the German keyboard altogether. PROBLEM: My computer still switches itself back to German every now and then, and there's no way to get away from that again. I see the language selector (see screenshot) and I can choose the non-German item, but as soon as I click inside another window, the indicator jumps back to German. Only a reboot helps... for a while. I've tried installing the German language and then removing it again, but it still remained. 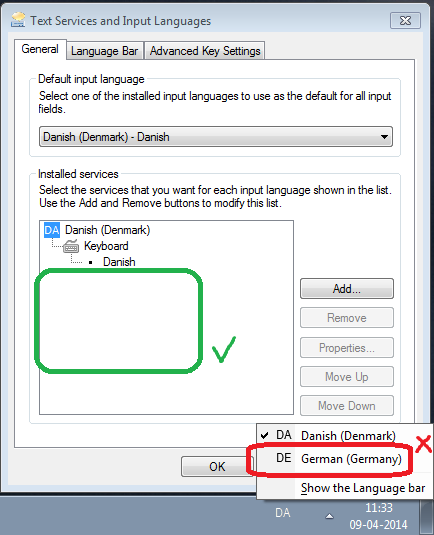 I also tried installing the German language with several layouts including US English, and then the list contained three languages: English was listed as a language even though it was only installed as a layout. Rebooted, then uninstalled the German and all its layouts again. --> Now I have Danish + English instead of Danish + German... ?! Windows is still broken but in a better way because at least I got rid of the swapped Y & Z keys. Screenshot: The indicator shows that the German keyboard is active -- but it's not even installed!!?! What is this sorcery? How can I get rid of that German layout? Browse other questions tagged windows-7 keyboard keyboard-layout language or ask your own question. How can I set up my computer to convert ae to æ, oe to œ and !? to ‽ on the fly? 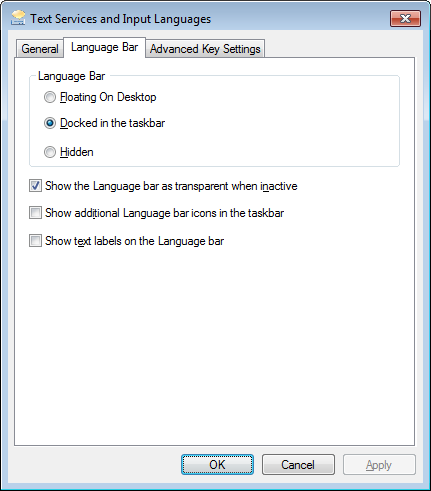 How to remove additional keyboard layouts if I can't see them in control panel in Windows 10?